The 2016 presidential election was called, and the reaction was swift: gifts poured into nonprofits typically associated with progressive causes, from the environment to social justice. Popularly termed “rage giving,” this grassroots phenomenon continued into 2017. 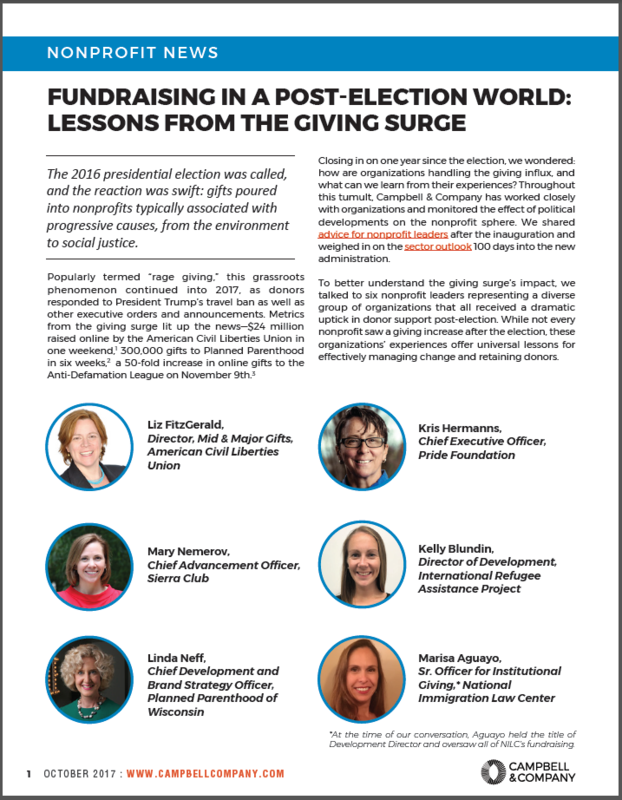 Closing in on one year since the election, we wondered: how are organizations handling the giving influx, and what can we learn from their experiences? To better understand the giving surge’s impact, Campbell & Company talked to six nonprofit leaders representing a diverse group of organizations that all received a dramatic uptick in donor support post-election. While not every nonprofit saw a giving increase after the election, these organizations’ experiences offer universal lessons for effectively managing change and retaining donors.